First Grade Follies: Feasting, Fun Apps, Fathers Day, and Five for Friday! Feasting, Fun Apps, Fathers Day, and Five for Friday! 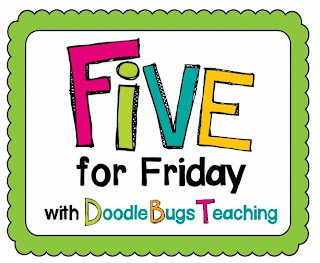 Another week has gone by and it's time for Five for Friday with Doodle Bugs! This week I've got a recipe, a little homage to my Daddio, and of course, some Instagram shots. 1. I've found a new, favorite, semi-healthy-if-you-don't-count-the-icing recipe to share. It's adapted from this recipe from food.com. I junked it up a little by adding tiny chocolate chips & some peanut butter icing but it really makes it good and I'll do leg-lifts while I'm eating them to balance it all out, okay? Seriously guys. Try these! So good! Mix the oats, brown sugar, baking powder and salt in a mixing bowl. Add the vanilla, milk, and beaten egg. Add the peanut butter, banana (I mixed these two in a bowl before adding to the batter and it worked pretty well). Add in the chocolate chips or cinnamon. Pour mixture into a lightly greased 8x8 pan and bake at 350 for 20 minutes. I just eyeballed this frosting. It's hard to screw it up. Mix together. If too thick, add more milk. Too thin? Add more powdered sugar and/or peanut butter. Spread on cooled bars and enjoy! 2. Have you heard of CocoPPa? It's a fun app that lets you create cute shortcuts for the apps on your phone. Maybe it works for iPads too? I AM sure that it's extremely addicting and I am ALSO sure that I now have a SUPERFLY cute app arrangement on my phone now. It's the little things, yo. 3. After a quickie Instagram poll I confirmed the fact that I'm not the only one who occasionally buys cute cleaning supplies in the hopes that they will magically make you want to stop doing whatever it is you're doing (most likely making a mess in my case) and start cleaning. I'm still waiting for the magic to happen. This week I bought this cute little set for $5 at Big Lots. I originally went in for a scrubber-thingy, something like a bottle brush, to clean smoothie-bits out of my Nalgenes. When I saw that this set came with fun gloves & a flower-shaped sink strainer, well, I had no restraint. Besides, it was only $1.25 more than the run-of-the-mill scrubber-thing. A small price to pay for a little style, don't you think? 4. I"ll admit. I'm occasionally (okay, sometimes more than occasionally) jealous of my blogging teaching buddies who have Target, Trader Joe's, and Costcos in their immediate vicinity. I'll usually drive at least an hour to Columbus or Wheeling to hit up the major stores and make a day of it. Honestly, it's probably better that I'm not close because I'd be broke! Living in rural America has it's perks though. Last night, after dinner, the Hubster and I went on a sunset drive in the county, which is only a few minutes away from where we live. I got some nice sunset shots, we met (and fed some grass to) a little family of donkeys (life with my husband is always an adventure), and rolled the windows down to let the smell of fresh-cut hay fill the car. Sometimes it's good to look back at where you came from...literally and figuratively. The sun goes down and the moon comes up. Billy couldn't resist. He's a friend to all- man and beast! Next time I'm bringing my good camera & a tripod! 5. 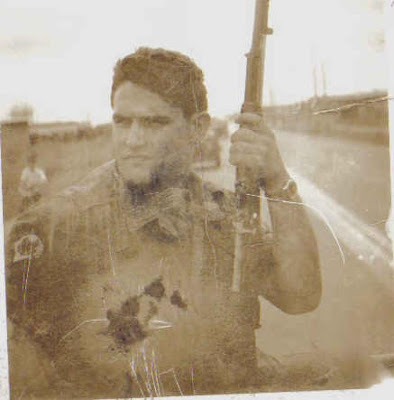 Finally, I'd like to give my Dad a shout-out. I'm definitely a Daddy's girl. He's where I got my sense of humor and my short legs. He's taught me to always do what is right, even if it's not fun or easy. He's always proud of my accomplishments. I'm lucky to be his daughter! I love this picture. It was taken in Vietnam. One of our first photos together. 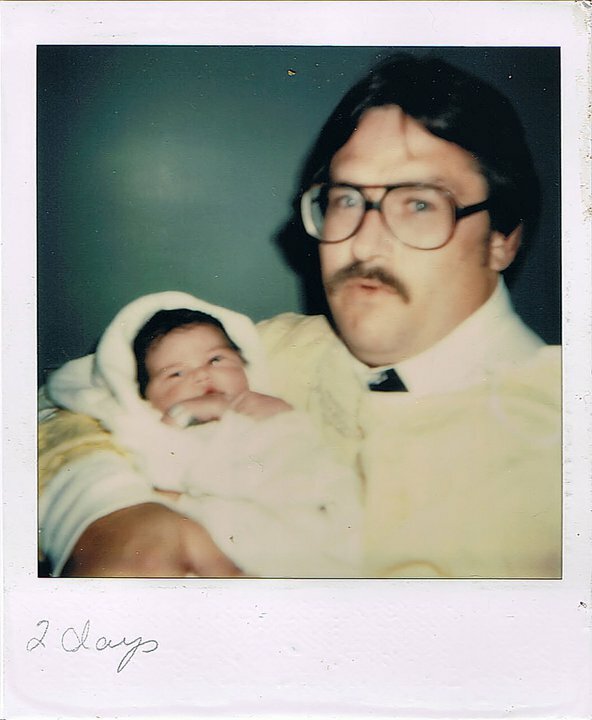 I was 2 days old. He looks like he doesn't know what he's in for. 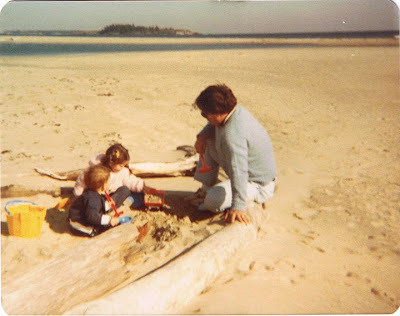 With my my brother and me at the ocean in Maine. We have sweaters and coats on- ha! We moved there when I was 4 and it holds a very special place in my heart. 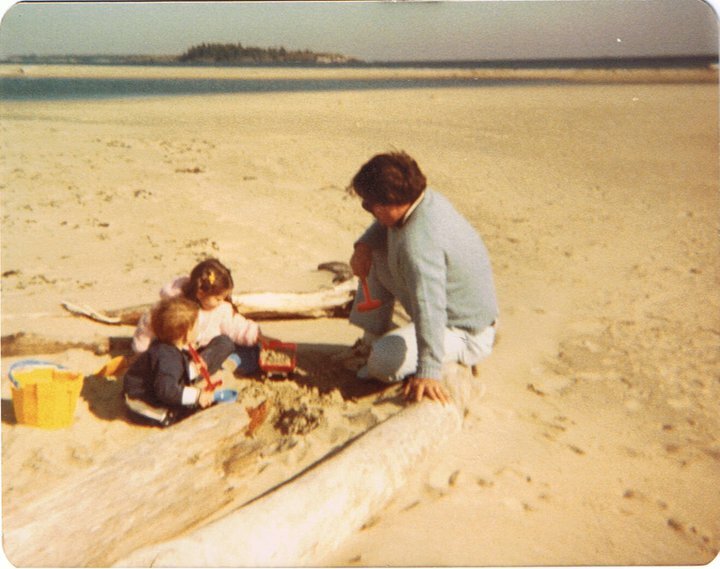 Growing up in New England was so wonderful. "Giving me away" at my wedding. Such a special moment! Makes me teary just looking at this! My favorite photo of us. 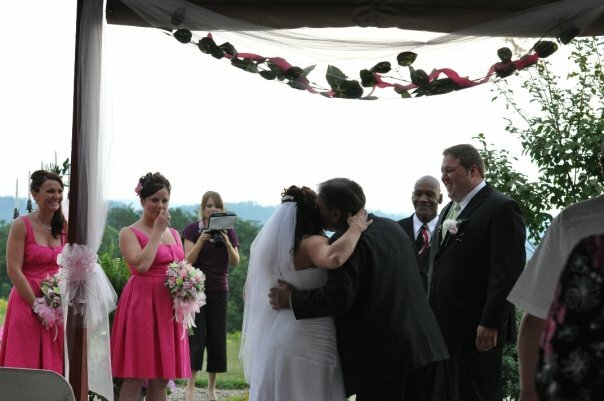 It was taken at my brother's wedding. People say we look alike. I see it here. 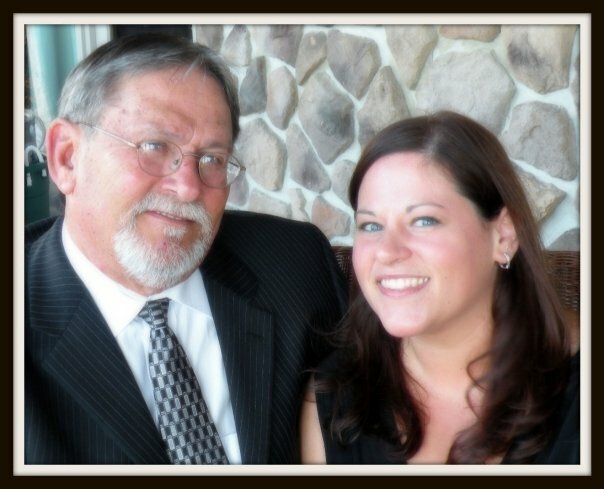 I'm also very lucky to have been blessed with a wonderful father-in-law too! He raised the sweet, strong, silly man that I married! He certainly deserves a medal for that! Aw, how sweet for Father's Day! The recipe looks yummy, too! Love your Ohio pics! Sometimes I think about California or Florida or some other warm place. But really I am happy to live here in Ohio. It can be really pretty here. I love seeing those photos through the years with your dad as you grew up - they're so special! I have never heard of that app that lets you design your own iPhone buttons, but I've come across it about five times today! I will have to check it out. Thanks for the recipe...sounds yummy. Precious tribute to your Daddy! Loved reading it! Also loved that recipe and those super cute cleaning supplies!! Happy Friday! Dads are so special. I lost my Dad two years ago and every once in a while I'll see or hear something that brings him back to me. It always takes my breath away. Tell your dad how much you love him every chance you get. I send a prayer my dad's way every night. Have a great weekend. Glad I found your blog through the 2 giveaways we are both participating in. Have you had any problems using the CocoPPa app and having your phone crash? I have heard mixed things and I am worried about downloading it. Your design is adorable. Happy to be a new follower.